My 8 year old Australian Shepherd, Oreo is a true Hero. He has been my Service Dog as I am a cancer patient and suffer from PTSD as well. Many times over the years he has come to my aid and buffered falls and warned of oncoming panic attacks as well as seizures. This past December I took a very bad fall. I hit my head on a glass top dresser and cut open my forehead and cracked my skull. I was immediately covered in blood, but able to get up, grab a towel, cell phone and wait for the ambulance. After coming home from the hospital, the story began to become clear. Oreo was also covered in blood, my blood. He also was limping very badly and not bearing weight on his back left leg. I called the vet immediately. Oreo has a broken leg and a hip out of joint. It seems he dove under me in a flash, to brace my fall and is now badly injured. Doctors tell me had he not done so and I had hit my head harder I would not have gotten back up. Oreo saved my life! His injury may cost him his own life. I will do all I can to help save this wonderful friend that God has blessed me with. 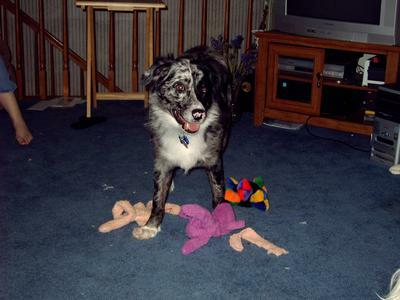 I had to say a sad final goodbye to my beloved Australian Shepherd, Oreo on 1/13/2014. He has been both my friend as well as family. A loyal companion and guardian and a hard working Service Dog. Oreo has saved my life on more than one occasion. I of course was with him to his very last. I told him about Jesus and how the Bible says "Let everything that draws breath praise the Lord". That includes him! I also told him that Revelation says the animal kingdom will be restored. I have no doubt that that he is already running again, chasing squirrels just like he loved. No more pain. I asked Jesus to care for him. Told him go find my Dad, who will love to be his friend. Also to search for my best friend who passed away 30 years ago and had always longed for a dog. Then I said, when my turn comes, After I meet Jesus, I know he will be there to greet me. I know Oreo is out of pain, still . . .my heart is broken. I just can't begin to imagine life without him . . .
You have a wonderful friend! He thought of your safety before he thought of his own. I really hope and pray that the doctors can make him well and you'll have many more days together.